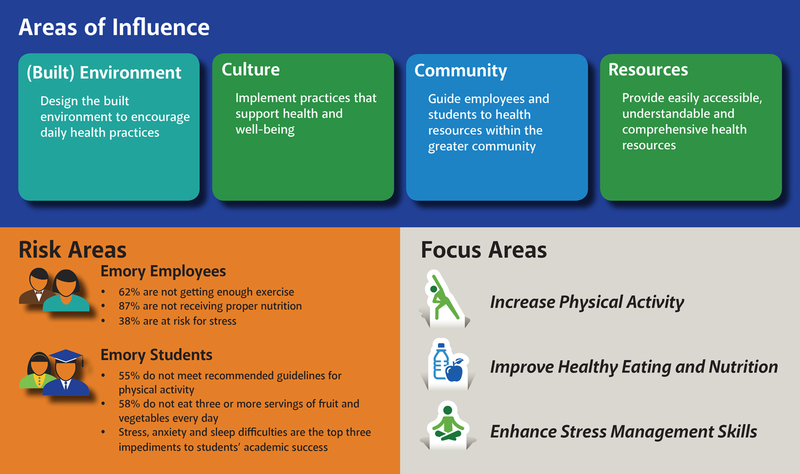 The Healthy Emory initiative was established in 2013 to develop an inclusive approach to health promotion, well-being, recreation, fitness and healthy living across Emory. The goal is to create easy access to programs and services for employees, their families, students and the community that Emory serves. Healthy Emory envisions a community that is committed to creating and sustaining a culture of well-being, using its expertise in research, health care and higher education to engage, inspire and support each individual to live healthy and flourish. To help further Healthy Emory's vision and goals, Emory's health and wellness team develops a wide variety of programs and resources in the three focus areas.